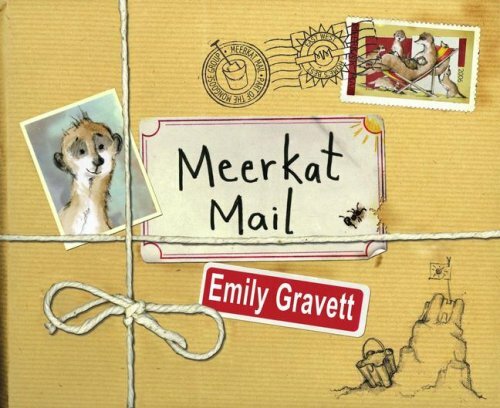 Illustrations by Emily Gravett always leave me sighing. Or is it singing? I guess whichever one conveys my happiness at being part of the way she sees the world. In Meerkat Mail, Sonny gets tired of always being around everyone ALL OF THE TIME. After all, the meerkat motto is “Stay Safe, Stay Together!” But Sonny longs to explore, and so sets off to visit some of his cousins  different mongoose families across Africa. He sends postcards home to tell where he is and what he’s doing. (Apparently, he doesn’t Twitter.) In the end, of course, there’s no place like home. The postcards he sends are taped in the book, which is pretty cool. The art is fantastic, the learning is subtle, and the humor is ever-present. Gravett’s books often have a bit of darkness to them, and here that nod is seen in a jackal that stalks Sonny on his journey. The question remains why the predator doesn’t... ahem, eat him along the way. So maybe the threat part is a little contrived. It’s a minor complaint, though, for a majorly great book. I was hoping to escape the latest wave of blog angst, as one might hope to miss the latest flu outbreak going around the office, and I suddenly realized that the similarities are uncanny. Both are extremely uncomfortable. Both can cause a weakened state, uneasy sleep, and loss of appetite. Extremely contagious, they can wipe out a community. Recovery can be slow. The best hope is that during the summer, the illness dies out as people are less connected. In thinking about this latest epidemic, I’ve been wondering what I can do to help myself and my fellow bloggers. Truly, I don’t underestimate the power of the disease. At times, blogs have even died  I’ve seen it happen. As it occupied the back of my mind these last two weeks, the old standards for preventing disease came to me as my own blog salvation, and maybe yours. The first rule of preventing the spread of illness is based on continual vigilance. If you are in the habit of washing your hands frequently, you’ll pick up fewer germs. If you become even more aware of the practice during particular outbreaks, you can reduce your risk significantly. As it applies to your blog, I’d say you can prevent a blog flu or reduce its severity by maintaining an ongoing awareness of your personal blog mission. Some may find it contained in their review policy, though I tend to see that as more of a statement to the outside world than to yourself. Personally, I could name my reasons for blogging in priority order at any time, and in none of them do ARCs or free books make an appearance. I am comfortable with the choices I’ve made in balancing my relationships with my reviewing and my sense of fun with a nod to professionalism. More important perhaps than my comfort is my constant awareness of those choices. As illnesses sweep down, I swear by Vitamin C  even though everything I read says it doesn’t make any difference. But I think that there’s a case for it. There is the element that one believes that it is working, but I’d put even more emphasis on the sense of taking control, being active, doing something. For blog flu, you can boost your immunity by getting involved in something you love about book blogging. Do that interview, or write that exciting review, or even take a short break to read that amazing book. Drop briefly the things that are draining your energy, because you need your strength. If we want to prevent the spread of disease, we have to acknowledge that we may become the cause. Perhaps as carriers with a mild case, or on our way to getting sick. Either way, we have a responsibility to cover our mouths when we cough. Okay, this rule may be the most direct an analogy to blogging. Because as bloggers, we tend to share. And when we have something to really share, it’s hard to hold back. But it’s one of the ways we spread the blog flu from blogger to blogger until everyone is sick  sick and tired of talking about blog angst. Notice though that I said cover your mouth when you cough. I didn’t say don’t cough. It isn’t realistic to expect that we would hold back talking about our blog flu any more than it’s realistic to not cough during a cold. But we can be careful about how it impacts others, and maybe that involves softening the sound, reducing the force, turning away. If, despite efforts at prevention, you find yourself coming down with the blog flu, remember to take good care of yourself. Just as you can go a few days without eating much more than saltines and soup, you can go a few days without blogging (or blogging very little). Your blog won’t starve during a case of blog flu. And just like you don’t lose weight during those days of low-calorie meals, your blog won’t lose statistics. And if you do lose weight or stats, once you’re back at full power, both the pounds and visitors come back. Look to the things that make you feel good, or at least feel better. Tap into strong relationships. Find things that make you smile. A sense of humor can be a saving grace. A well-developed sense of irony is better than a good night’s sleep. I’d be remiss if I failed to mention that laughter is the best medicine. Except for Percocet, which is really good, too. With the whole Father’s Day thing I wasn’t able to put as much time into Bloggiesta as I had hoped. Well, that and the trip to Ross and the stop at Petco where I had to hold a kitten up for adoption (no, I didn’t bring it home). And of course the sheets needed changing and the newspapers needed recycling and The Colbert Report needed watching. I didn’t keep good track of my time, but I think I’ve spent about four hours on the computer today. I don’t feel that I accomplished much for that amount of time. I deleted some bad links from my blogroll. I read some posts I’d been meaning to give a more concentrated look. I deleted a lot of emails. In the month of May, I must not have deleted anything except spam. The best thing I did was add some of the parenting blogs and general interest blogs to my Google Reader. Originally, I had wanted to keep my reader for book blogs, figuring I’d use my blogroll to visit the others occasionally. Instead I found that I haven’t been to them at all. As I was checking out the links, I found myself laughing and realized how much I’d missed the humor and variety they lent to my blog diet. I also had a lot of time on the computer getting used to the trackpad. It’s kind of driving me crazy now, but Bill swears I’ll learn to love it. I’m pretty enamored of my laptop in general, so I’m sure we’ll be fine together after we pass the getting-to-know-you stage. 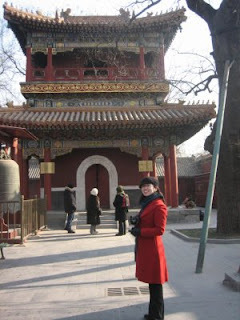 I’ll end my Bloggiesta participation with ten hours and some light blogkeeping completed. I participated in eight of the mini-challenges  which were all excellent. The challenges were helpful in giving me some focus, because this weekend I wasn’t up for thinking through the things I needed to do. I know that the idea came from catching up on reviews after the 48 Hour Book Challenge, but I guess I’d rather do this kind of blog upkeep in the dreary winter months rather than the first days of summer. Overall though, a good opportunity to get some things done. I’ve spend six hours on Bloggiesta, much of it on mini-challenges that were offered by various blogs. I cleaned up my Google Reader a bit by using the “trends” tab to find and remove inactive blogs. Then I added a couple of new blogs through looking at random blogs participating in Bloggiesta. (I tried the Lost numbers first to select my blogging visits  4, 8, 15, 16, 23, 42.) I checked up on my Google Alerts, though I’m finding that they are not catching my blog mentions and I don’t know why. I added my blog to various directories, and I secured a blog buddy. (It’s you!) I learned about anchor text at GalleySmith (see, that was using anchor text correctly my making the link the blog name). I read some blogging tips articles at Problogger, including a great one on increasing blog traffic from SEOmoz. I also used website grader to run a report on MotherReader and to make some changes to improve my marketing by search engine. This was my favorite tip, given by Bookish Ruth. 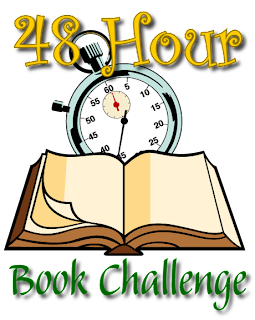 I’m sorry, but I ran out of steam to provide all the links to the many bloggers providing the mini-challenges, but they are all listed at Maw Books. If you are looking for concrete tasks to improve your blog, check them out. Tomorrow I’ll work on typing in some reviews. Maybe I’ll even play around a bit with templates and such. You know, typical Father’s Day activities. With Father’s Day coming up, today’s post at Booklights features three picture books about dads. I didn’t select my personal favorites, choosing instead to highlight ones that were a little bit different. Head over and add your recommendations in the comments. Oh, I also mentioned Book Dads as a website/blog devoted to finding books that feature positive images of fatherhood. Just a site you should know, if you don’t already. I had all these mighty plans to review like the wind this week, but I am beat. Really beat. I know that the period between mid-April and mid-June is crazy-busy for me, but I’m usually able to keep enough in reserve to make it to the end without falling apart. This time I’m crawling to the finish line. Graphic novel sections of Frankie’s imagined adventures lend a sense of fun to the story of a regular boy. It’s like a boy version of Judy Moody meets Babymouse meets Indiana Jones. This great early chapter book, with lots of humor and fun, is one to watch for a sequel. I’m a sucker for summer stories. I love being in the middle of summer and reading about someone else’s summer. It’s like having two for the price of one. I guess I kind of collect summer books, at least in my mind. Off the top of my head, some of my favorites are: The Liberation of Gabriel King, The Penderwicks, Monsoon Summer , An Abundance of Katherines, Cicada Summer, Lowji Discovers America, and Cassie Was Here. Anyway, while Jenny Han had me interested in her book the moment I knew that she was writing one  huge Shug fan here  I was especially excited when seeing the title for the first time: The Summer I Turned Pretty. I felt a particular connection to the story, having spent my childhood years at the New Jersey shore for weeks at a time. I looked forward to those days of digging in the sand, swimming in the ocean, and watching the sunrise. As I turned to teenager, it became less about playing with the shovels and more about walking along the ocean in my bikini. In Han’s book, Belly measures her life by summers when she stays in a beach house with a family friend. While Belly’s mom and her friend Susannah spend time together, Belly tags along behind her brother and Susannah’s boys. She takes on the role of younger sister to Jeremiah and Conrad, and sometimes it chafes her like the sand in her swimsuit. But this summer is different, because Belly has finally come into her own. She’s grown up now and things are changing. Going back and forth between the present time and Belly’s previous summers, the book gives a full sense of Belly’s relationships and her growth. The shore setting gives us crab dinners, boardwalk outings, beach parties, and midnight swims. You can practically smell the salt air. Simply a wonderful summer book. If you’re in the DC area, Jenny Han will be signing books in Northern Virginia. On Saturday, June 13th, she’ll be at Aladdin’s Lamp in Arlington at 2:00 p.m., and on Sunday, June 14th, it’s Hooray for Books in Alexandria, also at 2:00 p.m. I plan to be at the Sunday signing with my daughter and some of her Girl Scout friends. 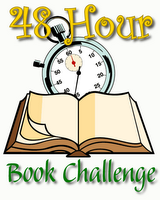 My Life in Pink and Green, by Lisa Greenwald, was just the book I needed at this stage of the 48 Hour Book Challenge. Light and a quick read. For Lucy, the family-owned pharmacy has always been a second home to her. Now a seventh grader, she even helps out with the workload. Unfortunately, as business has taken a downward turn, both the family’s finances and the pharmacy itself are in danger. But Lucy isn’t one to just give up, and tries to save the day with her love of makeup and the environment. Lisa Greenwald does a wonderful job capturing tween insecurities and new crushes. 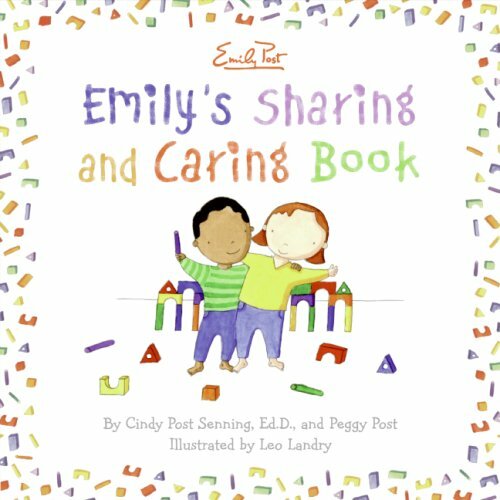 With the characters’ involvement in the Earth Club at school, ideas for helping the environment are included naturally in the book. In fact, since Lucy gives information on makeup application during the book, and tips are part of every chapter title, girls can also come away with a healthy look at cosmetics, too. 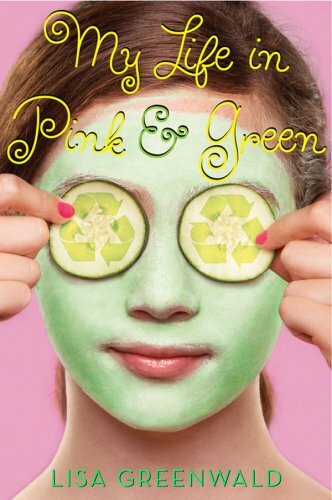 So in one book you get information on going green, looking beautiful, talking to boys, and taking initiative. That’s a bargain! If you’ve read Walter Dean Myers’ book Monster, you’ll be excited to see that he’s written another book in the same screenplay format. Unfortunately, you’ll probably be disappointed upon actually reading it. It’s not easy for me to say this, because I respect Myers and what he’s brought to the canon of Young Adult literature, but Riot is no Monster. Not even close. Monster used the screenplay format to bring the reader into the action. The language was real, and the story was gripping. I remember listening to it on audiobook  something I rarely do  and sitting in my car outside my house because I couldn’t leave. It was masterful. Riot tries to apply the same technique, but falls flat. The action jumps from scene to scene with no sense of flow. Myers’ grip on contemporary language  the book is set in 1863  is stifled and the dialogue is stiff. The story incorporates too many characters, scenes, and timelines to work with the style. The book is about days of violence against African Americans when Irish immigrants, angered by the draft for the Civil War, find another minority to attack. 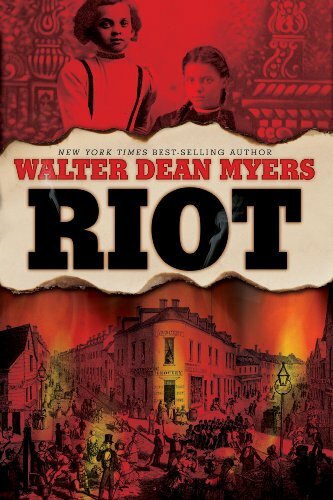 Riot mostly follows Claire, a biracial teenage girl, but also zooms in on her family, her friends, soldiers in the street, and an Irish immigrant couple. If it’s my skin that makes me unsafe, can I take it off and put it in a drawer until the streets are calm again? If it’s my skin that puts me in the sights of murderers, can I change it the way I would change my dress or my apron? Where is the “safe” you’re talking about? And if I’m black and you’re white and that makes me a target, where is this “family” you’re talking about? Where is it, Mum? Where is it? You can get away with this kind of dialogue in a play, which has its own stylistic conventions of speech. It could have worked in a standard book, where we could follow Claire’s thoughts as well as her words. But for a screenplay, the language is almost painful to read. Sorry. I wanted it to be good. What can I say? 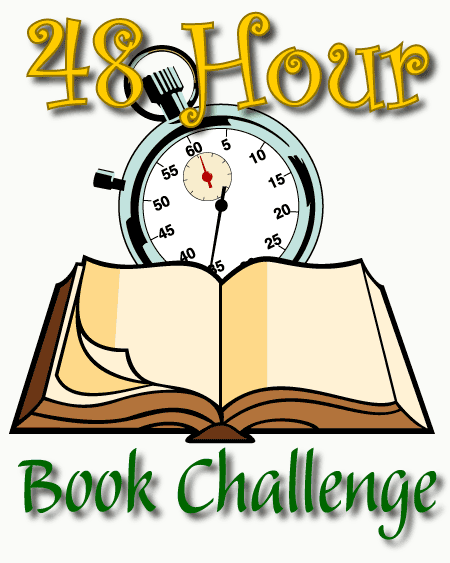 I’m at the halfway mark and have fifteen hours, four and a half books so far. Not my best work. Actually, I’ve felt more focused when I’ve had more things on my weekend schedule because I had to get out of the house and do something completely different. I’d come back more refreshed and excited to read again. Today it’s been harder to keep up my energy. 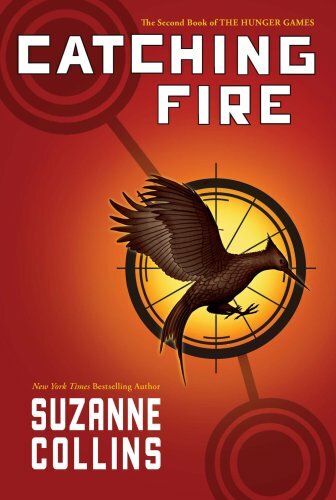 I know that I’m going back to Catching Fire later tonight, after my seventh grader finishes it. Now I need to pick a book that I’m excited about. Or maybe something funny. How are you pacing yourself? You’ve read the rules. You’ve cleared your schedule  well, except for that graduation/recital/tennis lesson. You’ve stacked your books and stocked your snacks. Let’s go. When you start your reading, sign in with Mr. Linky here. Keep track of your time  which includes reading, blogging, and some connecting (as stated in the rules). On Sunday, I’ll have a Finish Line post where you can leave the link to your final summary page. As a backup, link to the Finish Line post in your final summary. 112. Christina @ Flip the Page Book Reviews!